This reverse triangulation skidplate is made out of delrin and mounts your links on the inside of the chassis to prevent getting hung up on rocks. It includes all necessary hardware and bolts directly to all the Axial AX10 line of crawlers. Reverse triangulation skidplates allow your crawler to have proper suspension geometry and articulate freely. We bolted this skidplate up to a stock AX10 ARTR and it worked perfectly. There was less getting hung up on rocks and the suspension geometry made the crawler more stable. This is a great inexpensive upgrade to improve your performance in competition. The heavy-duty motor plate for Axial’s AX10 line of crawlers is available in black or brushed aluminum and is made to take a beating. It’s CNC-machined out of aircraft-grade 6061 aluminum and is 1mm thicker then the stock plate to prevent flexing. This hop-up bolts directly to any of Axial’s AX10 line of crawlers without additional hardware. Ours was tested on the Project HBZ Warthog truck. It bolted right up and gave us no problems. We ran the truck for about 30 minutes with a brushless crawler motor and there was no flex. These links are made out of delrin to slide over the rocks easily and are bent for high clearance. 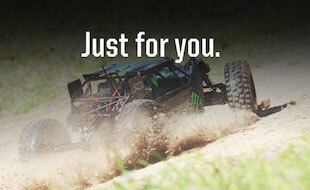 They are a direct bolt-on to all of Axial’s AX10 line of crawlers. They come in sets of two and only require the stock Axial rod ends to install. Using high clearance links will improve ground clearance and help your rock crawler get over those difficult obstacles. These links are made for the Axial SWX competition chassis. They are made out of black or white delrin and slip over rocks with ease. They require the stock Axial rod ends. I installed these on my Axial SWX comp rig and they look great in black. I had no problems with durability, and while I didn’t see any noticeable improvement in my crawlers’ performance, I know that delrin is slick and will give me an edge in serious competitions.